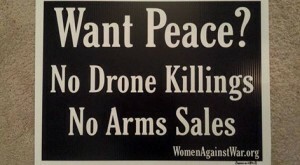 What Is Women Against War? Women Against War brings together Capital District women to work for peace. We advocate for changed US foreign policies through lobbying, leafleting, vigils, media outreach & educational events. Women Against War offers speakers, demonstrations, and exhibits throughout the year. 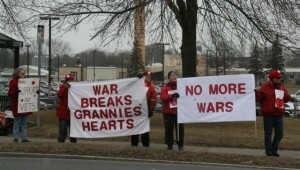 One of the WAW project groups, Grannies for Peace, holds annual vigils or demonstrations on Valentines Day (“war breaks Grannies hearts”), Mothers Day, and Veterans Day. The Iran project group advocates for negotiations with Iran by handing out leaflets, lobbying our legislators, and vigiling and leafleting with banners and photos of Iranians, at the popular August food festival at the Empire State Plaza in Albany. These are just examples of WAW’s busy schedule. Please join us! See our project pages for information about past and upcoming events. To find out more about our previous actions for peace and justice you can visit the ARCHIVES of our earlier website, Thanks to Daniel Wilson for creating this link. 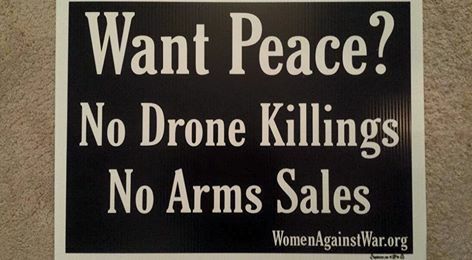 Free Yard Sign Campaign: All during 2016 Women Against War has made these yard, vigil, or window signs available. We only produced 250 signs. You will now see them at vigils and demonstrations sometimes accompanied by a large banner with the same message. Alice Brody's photos from our November 29th "Children are Starving in Yemen because of US bombs"